Welcome to Quick Lit, where I share short and sweet reviews of what I’ve been reading lately, and invite you to do the same. Lately I’ve been focusing on spring’s new releases, though I also checked off a book I’ve been meaning to read for a while. 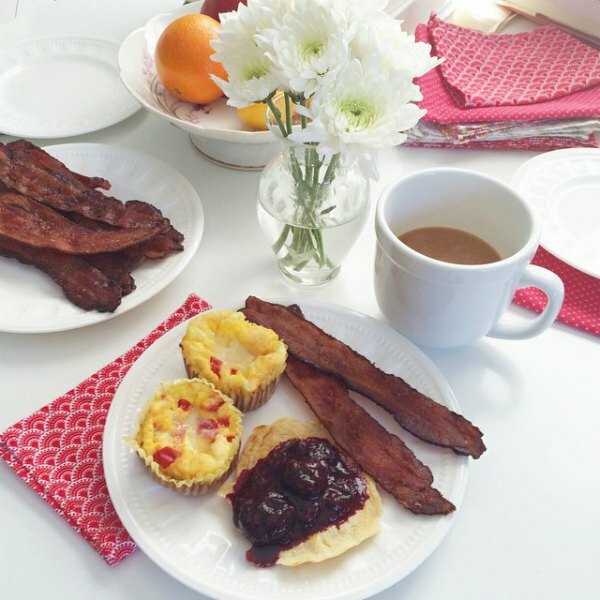 Next:Our newish special breakfast tradition. I’m glad to see you mention the Bookseller because I LOVED it! Couldn’t put it down, wanted to see what would happen. But I also love the movie sliding doors. I couldn’t get into the Precious Ones and normally I love her work so I think I will try it again. I loved Sliding Doors! But The Bookseller just didn’t grab me like that. “Cat’s Eye” is my current read. I haven’t read Atwood in awhile, and I missed her, so we’re hanging out with a cup of coffee and a couple of noisy birds fighting over nesting territory. 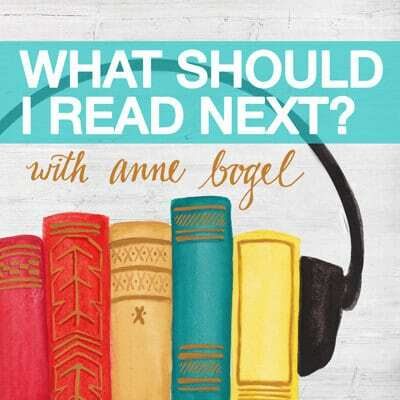 I was looking forward to “The Nightingale,” so here are my questions for you, Anne: Since nothing ruins a book for me more than poorly-developed characters, should I even bother with this one? When you finished the book, did you feel like you’d wasted time that should have been spent with a better book? Re: The Nightingale. That’s so hard to answer! I did feel a little like I’d wasted my time, but that’s personal: I had high hopes for it as a MMD summer reading pick, and I have a lot of advance copies and recent releases to read through, and after reading half of The Nightingale I knew there was no way it would make the cut. On the other hand, after hitting the halfway mark, I DID keep reading. If you do read it I’d of course love to hear your thoughts—especially as to whether or not you’re glad you read it. I’m a little over halfway through the Nightingale and can’t put it down. Totally sucked in! I enjoy reading Kristin Hannah when I want a reliably easy read with stock characters. The only time this didn’t happen was with Winter Garden. That book caught me off guard; I wasn’t expecting the flashbacks to have so much history and grit to them. It was a hard, sad read, and I count it as one of my favorites. 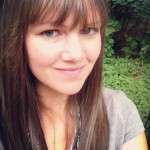 I would like to see Hannah’s work transcend the obvious a bit more often. I have The Nightingale on the way. I agree. Winter Garden is among my most memorable fiction reads. I haven’t read Nightingale yet, and Hannah’s last novel disappointed me. I have really enjoyed most of her books, though, so I will give it a go. Do I have to pick a favorite?? Happiness for Beginners sounds good! I’ll have to check it out. 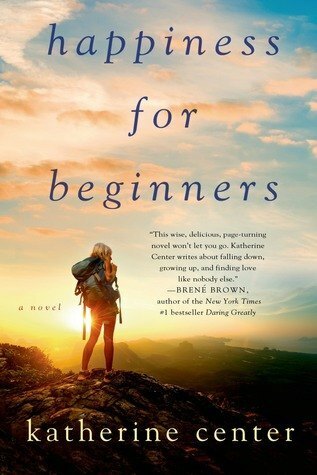 I’m a backpacker, so I wanted to love Cheryl Strayed’s Wild, but the drug use etc got a little heavy for me. So maybe this is a good alternative? I’m so disappointed that you were disappointed in the Nightingale because I am one of those who absolutely LOVED it…and everyone I know who has read it has loved it. I guess I’m just going to have to read The Girl You Left Behind now! I would love to be able to talk about both books with readers who’s read them! Let me know if you do: I’d love to hear your thoughts. I felt the exact opposite! Now I’m wondering what *I* would think if my own reading order had been reversed. Those two books would be fun to discuss together at book club. I just finished Lev Grossman’a The Magician and am still undecided about how to feel. The main character is despicable but is by no means loveable. The story felt rushed and glossed over what I thought would’ve been important key plots to the story… I’m currently waiting for The Invasion of the Tearling to be released, so I’m experiencing that feeling where every book I try to read is a huge disappointment because I’m highly anticipating a different book. Oops I meant the main character is NOT despicable. He’s a very “meh” character. Pardon the typos. On my phone! I felt the same was about The Magicians! I was starting to think I was the only one! Nope I’m with you guys! I thought one part of the book (the beginning? can’t remember now) was really really good, as if it had been written years later than the rest of it. The rest of the book – meh. The ending was a letdown and I let the series drop. I totally agree!! I borrowed the next book in the series from my library, but I’m so unmotivated to read it. My TBR list is so long that I feel like I don’t even want to waste my time on an “alright” book. 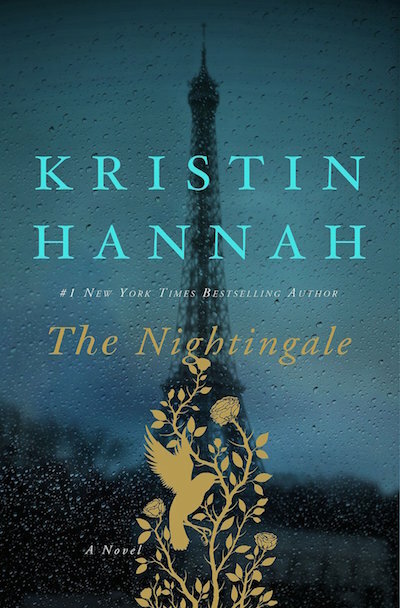 I’ve only read one book by Kristin Hannah (Winter Garden), but had the same experience you did in being disappointed in the formulaic characters. Oh no! I’ve heard that’s one of her best and it’s on my list. 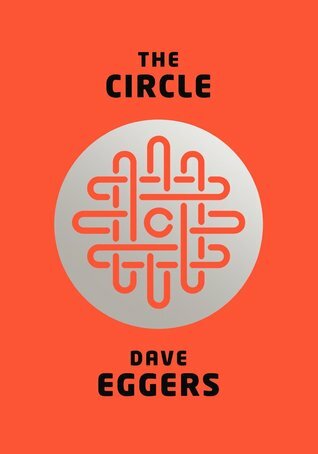 I read The Circle last year, it freaked me out a little bit. It really gives you a lot to think about. Happiness for Beginners sounds great! I’m totally looking forward to checking out Savor. It’s on order at my library…I hope it comes soon! Thought I think the frying bacon or an onion advice sounds totally weird! 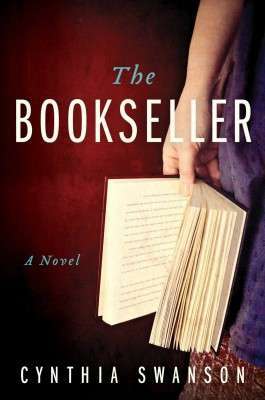 I’ve been hearing lots of press about The Bookseller. 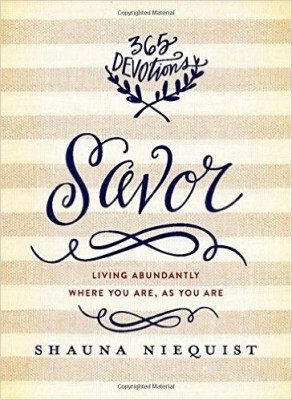 And I like Niequist– I’ll look for Savor. I love finding a new-to-me author with a long backlist. Thanks for the recommendation of de los Santos! I haven’t read Kristin Hannah’s latest but I have been very disappointed by her last couple of books. Her earlier work is much stronger. Magic Hour is my favorite! I cannot wait to read The Precious One. 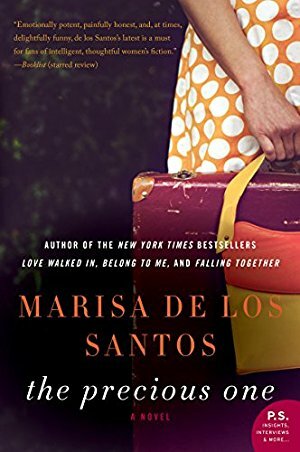 Love Marisa de los Santos! Thanks for the tip on Kristin Hannah, and I can’t wait for you to read The Precious One so we can talk about it! I really enjoyed The Nightingale but I think part of the reason why I enjoyed it so much was the other books I’ve read in the last year along the same strain. The Girl I Left Behind Me is one of those as is Code Name Verity. Would I enjoy it if I hadn’t read the others first? I don’t know but I had those characters in my mind as well as the ones from Nightingale. 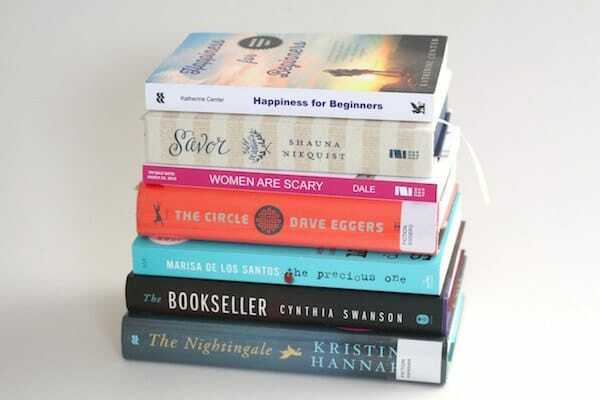 I have to admit, I’m intrigued by The Booksellers and Happiness for Beginners. 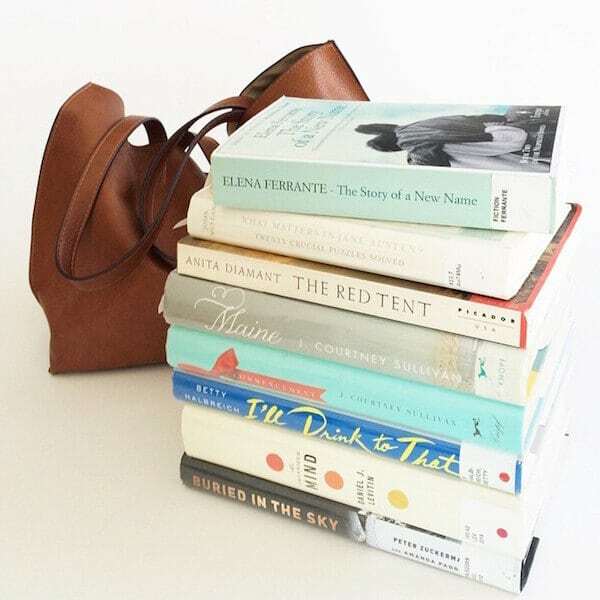 Several here I want to read now! Thanks, as always for great recs and reviews, Anne. I’m late to the game, but finally got caught up my quick lit for the year.